Bio: Born in France, Sylvain began his artistic pursuits in visual arts at Bordeaux’s School of Fine-Arts. Influenced by Post-Modern dance artists, he turned to the world of contemporary dance. He studied at P.A.R.T.S, a school founded by Belgian choreographer Anne Theresa de Keersmaecker, where he danced the repertory of Trisha Brown, William Forsyth and Pina Bausch. He then moved to Paris to further his studies in contemporary dance and somatic education. Major artistic influences include Katie Duck, Meg Stuart, Jose Cazeneuve, Peter Goss, Vera Mantero and Meredith Monk. 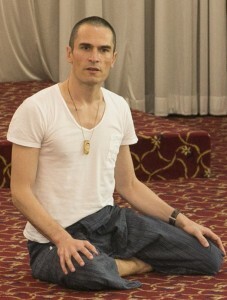 He has studied Body Mind-Centering® and Feldenkrais, QiQong with Master LiJunfeng, and Continuum with Emilie Conrad. In April 2014 he received a Master’s degree in Dance Therapy from CODARTS, Netherlands. Two months later, he partook in Continuum’s Wellsprings practitioner program. For the past 15 years Sylvain has been active as a performer, choreographer and teacher, working in a range of contemporary and experimental styles, collaborating with many different artists in Europe and Asia. In 2001, he joined the Amsterdam-based Magpie Music Dance Company, directed by Katie Duck. He has collaborated with Katie since then in various projects and tours internationally with music/dance improvisation performances. His solo work has been shown in France, Holland, South Korea, Czech Republic, and China. In Amsterdam, he initiated “Brain studies” a laboratory based upon Neurosciences and Shamanic studies, aiming for dancers and creators to experiment the field of dance improvisation and somatic awareness. Today it is part of the larger body of activities he offers called, “Ways of Moving and Being Moved”. It includes artistic projects and workshops, private practice in dance therapy, rituals and working with Nature. Continuum entered at a critical point in my life, when chronic pain restricted my movement and professional life. After several years of alternative and conventional therapies I still couldn’t find my way out. Meeting Emilie changed the picture, I recovered, even gained more expressive capacities in my movement connection and coordination, and acquired a new way of relating to dance – pleasure! Today, Emilie’s work supports my practice as a performer, teacher and dance therapist. Besides the elegance of the form, Emilie’s life and dedication to her work is a role model for my own inquiry about movement, healing, artistic and spiritual expression.